We appreciate motorists slowing down near crash and break down scenes. Buuuuutttt…. unfortunately some motorists slow down to have a gawk when they don’t need to – which creates bottle necks, slows traffic, and is known to cause crashes. 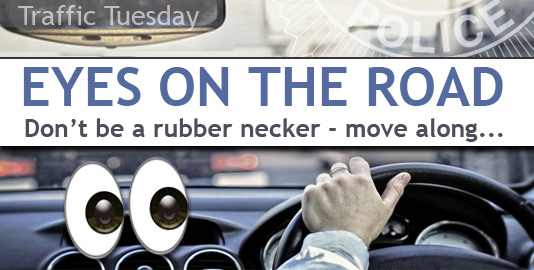 This page -- https://www.police.tas.gov.au/what-we-do/traffic-policing/traffic-tuesday/8-eyes-road/ -- was last published on January 16, 2017 by the Department of Police, Fire and Emergency Management.